The days of cheap gas are over. Gas is now a moderate expense for most of us yet there are a few simple things you can do to save some money, and help the environment by using less. Buy it as cheaply as possible. Apps such as ‘GasBuddy’ (iPhone and Android) make it easy to find the cheapest gas nearby. Pay attention to which areas have the cheapest prices too. Some towns/regions have consistently cheaper gas than others. Also look out for deals on higher-octane fuel. 91 octane fuel has approximately 3% more energy in it than 87, so if the price difference is less than that you are saving money. Driving style. It’s amazing that there isn’t more education about driving efficiently. The way you drive really makes a difference in how much gas you use, and it doesn’t always mean you are going to take longer to get somewhere. You can get 20% better mileage pretty easily by adjusting how you drive. Easy on the acceleration! Being gradual in the amount you accelerate saves energy. Try to avoid frequent rapid acceleration. Look up! It’s amazing how many people drive looking only 30 yards in front of them. Look up when you’re driving and see the traffic conditions ahead of you. Don’t accelerate into a stop light or traffic. Ease off the gas and coast in. Maintain a constant speed. Changing velocity (speed) uses energy. For flat highway driving use cruise control. Keep it 70 or under. 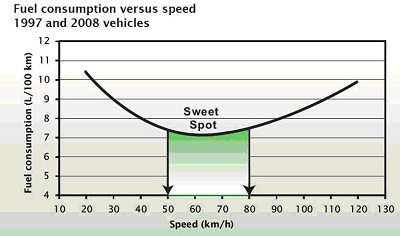 Cars just like jets have an optimum ‘cruise speed’. This is the point where they travel the most distance for the least fuel. A typical jet is 530-550 miles per hour, a typical car is 55-60 mph. It requires exponentially more energy the faster you go and the graph looks like a typical bell curve. Once you start driving over 70 your fuel economy plummets. Car maintenance. There are some pretty simple things you can do to help get the most mileage out of your car. Tire pressure. Under-inflated tires can add significantly to your vehicle’s drag. Make sure you keep your tire pressure at or above the manufacturers recommendation. They typically spec a PSI that is slightly lower to improve ride comfort, but you can safely drive on a bit more pressure. Oil changes. Oil can reduce your engine’s internal friction and therefore help it deliver more of its power to the wheels. Change your oil every 5000 miles. Certain oils have a lower viscosity which can also help reduce friction. Weight. Every 100lbs extra that your car weighs increases your fuel consumption by 2%. If you’ve got extra heavy junk in your trunk that you are driving around needlessly take it out! Drive smart. A little thought can save you a lot of gas with no fancy hybrid needed. Plan your travel. You can save a lot of fuel simply by planning on when to drive. Doing your travel outside of peak traffic time reduces the amount of time your car is running very inefficiently at low speeds or stopped in traffic. If you commute to work think about how you can alter your hours to drive when there’s less traffic. If you are running errands do it at a quieter time of day. It will save you both time and money! Think about your route. Most GPS units favor interstates when giving you directions, even if they are longer distance-wise. Depending on your route you can save fuel by taking more direct back-roads which can reduce usage by being a shorter distance as well as driving at slower more fuel-efficient speeds. Think about conditions. Rain and snow both decrease your fuel-economy by creating extra friction on your wheels. Extremely cold temperatures also affect the efficiency of your engine by requiring a higher fuel/air ratio. 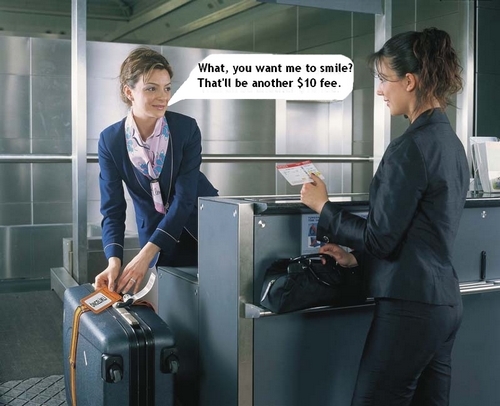 Hotels for cheap (or free)! There will be times when, despite being as popular as you are, you will have no connection with someone to put you up for the night. It may also be that you just want to stay in a hotel. Fortunately there are a few ways to stay in 1200 count egyptian cotton sheets for very little! 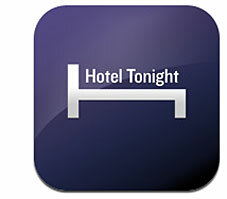 If you don’t have an SPG Amex, then my number 2 choice is an iPhone/Android app called Hotel Tonight. It gives you super deals on curated hotels in most major cities, but the catch is you can only book the hotel that day. The hotels they pick are all carefully chosen and so you won’t go wrong. Use my invite code ‘krobertson7’ and get a $25 credit for your first booking! Sign up using my invite code ‘krobertson7’ and get $25 in free credit!